It's the last week of October and we haven't really started to think about Christmas too much, but all that is about to change. Next Tuesday at 10am we will hear an announcement given over a loud PA system; “The Spirit of Christmas 2014 is now open”. For us, every year, the UK's biggest and best Christmas shopping fair marks the very beginning of the Christmas season. It all begins at the weekend when we drive our van down to London from our headquarters in the Highlands. Setting up then takes the best part of Sunday and Monday to ensure we are absolutely ready for the opening morning. Countless specialist retailers, several of whom stock festive goods and decorations, fill the halls of Olympia with every conceivable type of gift in anticipation of all the visitors that will browse their stalls in the ensuing days. When Tuesday arrives shoppers begin breezing into Olympia and enjoy the luxuriously presented fair and fulfil much, if not all, of their Christmas shopping. The atmosphere is festive without being nauseating, the corks pop at champagne bar and dozens of artisan food & drink companies offer delicious tastings and insightful presentations. There can be few places where you can see so much variety under one roof. From nightwear to notepads, vodka to vintage jackets, fine chocolate to fine china, sculptures to skincare, toys to tea bags and gadgets to garlic oil, there is undoubtedly something for everyone. We always look forward to seeing many of our regular customers and meeting new one's too, all of whom seem to appreciate our pyjamas and our business ethic of having everything made in the UK. 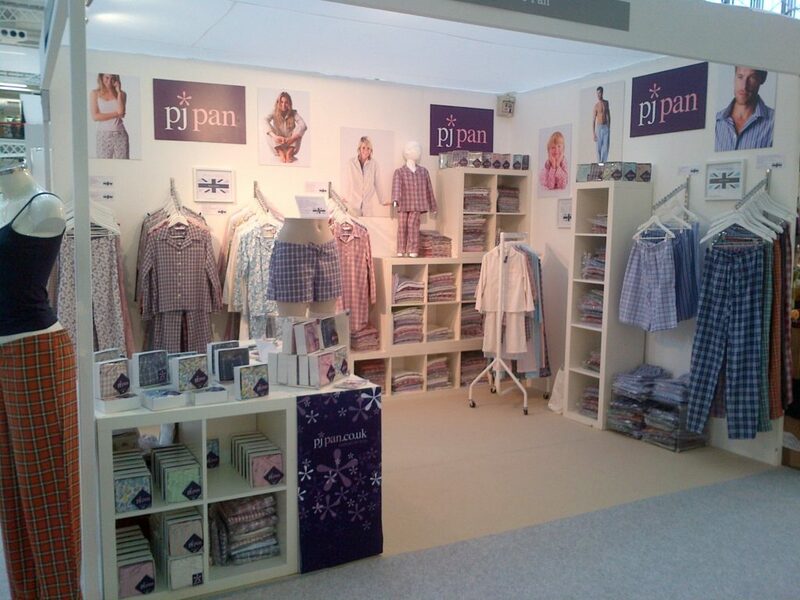 This year's PJ Pan stand will showcase our entirely British made nightwear collection including our new 2014 winter collection. We are also really excited about launching our all new silk ranges as well as our fist ever 'plain' pyjamas and a new round collared men's cut at this year's Spirit of Christmas. Everyday we encounter hundreds of Christmas shoppers and when the fair closes each evening we use our time in London to catch up with old friends. By the end of the week we will begin to feel decidedly festive and when we return to Scotland there's a very high chance that snow will be falling on the mountains. The season to be jolly will have begun, but we will have to stay focussed on customer orders right up until Father Christmas boards his sleigh. The Spirit of Christmas takes place at Olympia Grand, Olympia London, Kensington, W14 8UX and runs from Tuesday 4th to Sunday 9th November. Open 10am to 6pm everyday except Thursday when the fair stays open until 8pm and on Sunday when it closes at 5pm. You will find us at Stand H49 ....perfectly situated between the central Louis Roederer Champagne Bar and the Orchard restaurant!